A new website that enables mobile users to discover the best mobile applications and mobile optimised websites has been launched by 3 . The neXt website is designed by 3 to be a community-built guide to resources on the mobile internet. It's a fee service aimed at both 3's X-Series mobile internet using customers and other non-3 users. The neXt service is accessible from mobiles via a .mobi mobile-optimised address - http://3next.mobi - as well as though the regular internet at http://next.three.com. The neXt service lists existing independently developed applications for mobile internet-capable devices. Application listings on neXt include feature descriptions and functionality reviews, plus links and information on downloading apps. NeXt users can rate applications themselves, and suggest new applications that should be included on the site. 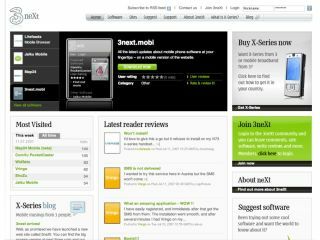 The neXt site will also list details of mobile optimised websites. The site will be regularly updated with new applications and mobile-friendly websites, after being reviewed for compatibility and performance by 3's neXt team. Among the initial services are photo-upload and backup service ShoZu and mapping services from Mapsolute , There's also a mobile version of Wikipedia from SevenVal and social networking applications from Jaiku. "NeXt is about making more of the things you can do on the internet available via your mobile handset - not just accessing websites but getting to some of the new applications that are changing the face of the internet," commented John Penberthy-Smith, marketing director at 3. "NeXt is about helping customers to explore a wider range of new and innovative applications."